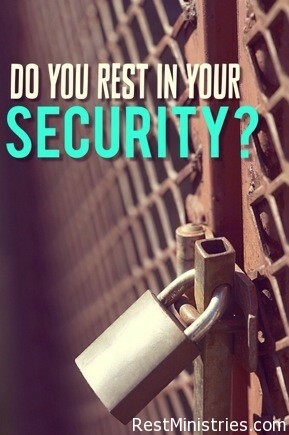 Do You Trust Your Security in Jesus When Worries Come? We buy insurance, update computer security, but Vicki asks if you are trusting your security in the One who saves. How would you finish this sentence: I couldn’t function without _______? Surely, many with disabilities might respond by listing a supportive device or person. Some people who are shut in may say they couldn’t function without their computer. Computers can be lifelines. Mine is used for writing and corresponding. Because I need it to work I recently renewed its security protection and this frees me from worrying about a virus that could destroy my work. I’ll pay top dollar to prevent corrupted files. Christ paid the ultimate price to end spiritual corruption. I’ve accepted His gift of salvation and can relax about my eternity. It’s living with a disability on earth that plagues me with worries! I wonder what my life is worth with multiple sclerosis. I worry because it’s getting harder to do things. It helps to remind myself that the One who overcame death can surely protect me from insurmountable challenges. He’s promised to equip me to do what He’s called me to do. As long as I use technology, I need to keep my computer in working order. I take good care of it. Christ “set his seal of ownership” on me. He knows how to take care of me. . . and of you. Prayer: Dear Father, remind me of the challenge the Psalmist gave when he wrote, “Trust in Him at all times, you people; pour out your hearts to Him, for God is our refuge” (Psalm 62:8). I’m grateful You invite me to pour out my heart to You. When anxiety creeps in, remind me You are my refuge. Praise You for being the One who helps me “stand firm in Christ.” You are my security. In Jesus’ name, Amen. Here’s a fun question to contemplate: What would you like to say to your computer or mobile device? « How is God Speaking to You In Your Day?